Home is where the heart is. The familiar adage has taken on new life since I moved to Ecuador. But my journey to get here actually started 37 years ago…when I became so enthralled by Darwin, the Galápagos Islands, and the country of Ecuador in 6th grade science class that I told my teacher I was going there one day. One day came via a divorce. But when it was finalized, I chose to stay in Ecuador. I have been living in and enjoying Ecuador for seven years now…and I wouldn’t change it for the world. And, it was the best decision ever, because that is how I met Gary. We both have a love of travel and adventure and we make the most of this passion, by traveling once a month, to different parts of Ecuador. When we’re not traveling, Manglaralto, a small rural town on Ecuador’s Peninsula of Santa Elena, is our base…and the place we call home. Though it is small, Manglaralto houses the local hospital, fire department, and even its own courthouse. It’s a peaceful town that has seen a recent rise in expats and expat-owned businesses; some of which are not what you might expect. Playa de James, is the expat hangout bar, and there is also an expat bookstore. One expat here performs sound bowl therapy, yoga, massage, reiki, tai chi, and qigong. If you like natural healing and eating healthy… then Manglaralto is for you. Likewise, if you just want to lie back and relax it’s hard to find a better place. Lush green hillsides face the cobalt blue of the Pacific Ocean and beckon you to stay awhile as you sip a margarita from under the Cabaña, which serve a variety of fresh seafood and tropical drinks. But what I think makes Manglaralto all the more charming, is that it’s right next to the surf mecca of Montañita—known for its alternative lifestyle and party-hearty nights. World travelers come to Montañita to test the waters of the best surfing spot on the coast of Ecuador. The town also offers a wide variety of cuisine at reasonable pricing. The next town just past Montañita boasts arguably the nicest beach in all of Ecuador…Olón. It’s a small community and is tight-knit, with many expats calling it home. The expanse of beach is impressive and great for families. You can spend all day eating at the many food cabanas, and walking the shoreline. Dos Mangas, which veers inland from Manglaralto to the Chongon Colonche mountain range, is a beautiful, subtropical, hidden national park where you can rent horses, ride bikes or hike through a lush canopy, leading you to hidden crystal-clear pools and waterfalls. The whole Santa Elena province is worth a visit. It is just an hour away from the popular resort town of Salinas…yet so different. 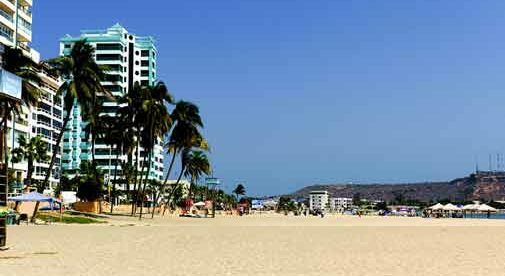 Come take a look for yourself at what some call the Malibu of Ecuador.